Well, in my humble opinion anyway! As many of you know the Henley Festival of Music and Art has year on year been my favourite event out of everything we do. Why it’s just SO Good! It truly is a classic English event with an atmosphere that I just haven’t found anywhere else on my event travels. With all guests in black tie and evening dress the scene is set and at 6pm when the gates open, music from jazz quartets to African choral bands floats along the air from the various marquees. Our clients generally all have dinner within the superb Albert Roux Restaurant, with an a la carte menu to rival the best London restaurants and all cooked on site with Monsieur Roux overseeing the proceedings. Performers on stilts and other alternative artistes, my favourite so far have been the men dressed as angels who flew around the Festival on electric scooters! Absolutely brilliant!! – entertainment and art exhibitions from wire structures to paintings are dotted about the Festival giving lots to see on your way to dinner. Of course, if you are watching the pennies and don’t think you can stretch to the gastronomic delights of Roux at The Riverside, then we can organise a truly scrumptious picnic hamper which could be waiting for you to collect on arrival at the Festival site. You can join the many other picnickers, some of whom go the whole hog with gazebos, champagne buckets and music to really get them into the mood! The highlight of the evening at The Henley Festival is of course the performance at 20:30 on the superb Floating Stage which I always think looks like a very miniature Sydney Opera House. Every evening has a different artist and this year headlines Kathryn Jenkins which I am afraid is sold out and Michael Parkinson presenting Friday night is Movie night on the Friday. Thursday is Puccini. An Operatic Genius which with the Bournemouth Symphony Orchestra playing whom I have seen on several occasions, will be a rousing evening on stage. A fireworks display which each year never fails to disappoint follows the concert and then guests return to the Albert Roux for dessert and dancing to the Jazz Band or visit the other marquees to see the rest of the performers. 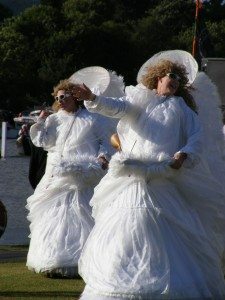 With the site on the banks of the Thames, boats moored up decorated with lights and the beautiful lighting of the Festival, it really is a super evening and I am delighted to be attending again this year!